The Pontifical Institute of Mediaeval Studies is proud to offer a new Diploma Programme in Manuscript Studies. A complete description of the curriculum, as well as details about eligibility and application, follows. The venue alternates between Toronto and Rome. This year our programme returns to Toronto, where it will convene from 3 June to 12 July 2019. Two courses will be offered: our core course MSST 1000: Latin Palaeography, taught by the Pontifical Institute’s Leonard E. Boyle Professor of Manuscript Studies, M. Michèle Mulchahey, and a Special Subject, MSST 1004: Decorating the Medieval Manuscript, offered by Adam S. Cohen, Associate Professor, Department of the History of Art, University of Toronto. For further details of the 2019 curriculum please see our flyer. The deadline for applications is 1 February 2019. 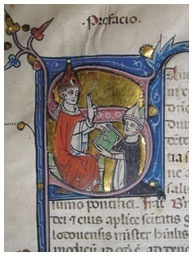 The Institute has long enjoyed a reputation for providing the best training possible in those technical fields that made its students uniquely qualified to pursue original research amongst the manuscript survivals from the medieval period, namely, Latin Palaeography, Diplomatics, Codicology, and Textual Editing. Over the last decade and more, the Institute has transformed itself into a research institution offering fellowships to young post-doctoral students and visiting scholars. But the Institute has now developed a new curriculum that will make training in these technical disciplines available again, and in an expanded fashion, leading to a formal credential in Manuscript Studies. The programme is open to all qualified applicants who feel they would benefit from it: those just embarking upon their graduate careers who realize that such training would be a valuable precursor to the work they are soon to undertake; those already enrolled in graduate programmes elsewhere who have recognized the need to acquire skills that their own programmes do not provide; those who have already earned their degrees and are in full-time posts but may be looking to enrich themselves. Given that many of these potential applicants will have other obligations during the fall and spring semesters, this new programme in Manuscript Studies is designed to run in the form of intensive summer courses in order to make it accessible to as many candidates as possible. The curriculum in Manuscript Studies offered by the Pontifical Institute consists of five core courses, made more expansive by one of those courses being a variable content rubric under which a number of different special-subject courses will be mounted. Students will be required to take four courses to qualify for the diploma in Manuscript Studies, and also to complete a graduating project. An intensive introduction to mediaeval handwriting in the Latin West from the late Roman period until the dawn of print, designed for those who wish to acquire the skills that will enable them to work directly with manuscript materials. Participants will be introduced to all the main mediaeval systems of abbreviation, together with the principles of transcription, through daily exercises in identifying, dating, and transcribing the various scripts. Scribal practices and the basics of manuscript production will also be considered, as will the context within which palaeographical developments occurred. Original examples will be viewed in the libraries and archives of Rome and the Vatican when the course runs in Italy, and in the Pontifical Institute's own collection when it runs in Toronto. A course examining the physical make-up and production of manuscript codices. The actual processes of manufacture of mediaeval manuscripts will be explored, including the making of parchment, the preparation of quires for writing, scribal practices, illumination, and binding. The changing context of manuscript production, from the early monastic scriptoria to the rapid reproduction of texts at the universities of the high Middle Ages, will also be considered. The proper method for describing manuscripts and how to exploit modern catalogue listings and other finding tools will be covered. The manuscript collection of the Pontifical Institute will provide firsthand experience with medieval manuscripts, and the bases for a final practicum. An introduction to the documentary survivals from the medieval period and the conventions used in their composition. The evolving practices of royal, ecclesiastical, and papal chanceries, medieval notaries, and private individuals when drawing up documents will be traced from the late-Roman period onwards. Practical exercises will familiarize students with charter forms and formulae, papal bulls, and other document types, together with the various documentary hands used over time. The editing of medieval documents for modern publication will also be discussed, through a critique of current published editions. Local repositories in Rome and the Vatican will be visited when the course is taught in Rome. An introduction to the textual criticism and editing of medieval texts from manuscript sources. Practical exercises will focus upon the transcription and collation of texts from multiple witnesses, with instruction in how to create a critical apparatus and an apparatus of sources. Modern editions of medieval scholastic and literary texts will be used to illustrate various aspects of the presentation of an edited text, from reconstructing the textual tradition and building a stemma codicum, to describing the manuscripts and the editorial conventions employed. A variable content course designed to take advantage of distinguished visiting scholars who will offer special seminars in their areas of expertise, illustrating how they use manuscript materials in their own research: the jewel in the crown of the programme. The majority of these Special Subjects will run in Rome, and will focus upon topics that draw upon the unique resources available in Rome and elsewhere in Italy. Can be repeated as content changes. The graduating project for those students pursuing the diploma stream. The topic of the Final Project will be developed in consultation with a supervisor chosen by the student from amongst the faculty who taught the courses in which the student enrolled. The Project must be built around original manuscript codices or archival materials, and show the application of the technical skills acquired in previous coursework within the research undertaken. All faculty involved in teaching the students will serve as readers of the Final Project. Courses will be available on a rotating basis, with two of the above courses being offered each summer. Students accepted to the programme may choose either simply to enrol for a single summer, that is, for the two courses offered in any given year; or, by taking four courses over two consecutive summers, and completing a Final Project, they can qualify for the Diploma in Manuscript Studies. Each course meets for three hours a day, three days a week, for three weeks, making it equivalent in contact hours to a standard semester-long graduate course. Courses run one at a time, one after another, for a total of six weeks each summer. This allows the students to concentrate intensively on one subject at a time, and also make it possible for field trips to be scheduled in one course without conflicting with the demands of another. The venue for teaching will alternate between the Pontifical Institute in Toronto and the Pontificia Università di San Tommaso d’Aquino, also known as the Angelicum, in Rome, to take advantage of the unique resources of each locale. In Rome, students will also have access to some of Europe's greatest libraries and archives – the Vatican Library, the Biblioteca Casanatense, and the Biblioteca Angelica amongst them – where they can study mediaeval manuscripts at first hand. Field trips will also be organized to repositories further afield and to special exhibitions that are relevant to the courses currently being offered. Most of the Special Subjects courses will be mounted in Rome, by instructors who are exploring topics that can be best illustrated through manuscripts and other sources found in the City, courses on such things as the popes and the papal chancery, the inscriptions of ancient and medieval monuments in Rome, mediaeval philosophical ideas as traced through manuscript transmission, the history of the Dominican order as told through the order's general archive at Santa Sabina. In Toronto, the emphases will be on those courses that take full advantage of the Pontifical Institute's great library, with its outstanding reference collection in palaeography and related fields. The courses will allow students to explore the Institute's own collection of medieval manuscripts and documentary sources, a collection built specifically for teaching purposes. The programme is directed by M. Michèle Mulchahey, the Leonard E. Boyle Professor of Manuscript Studies at the Pontifical Institute of Mediaeval Studies, who will also teach at least one of the courses most summers. Dr Greti Dinkova-Bruun and other faculty members at the Pontifical Institute who are especially skilled in various areas of Manuscript Studies will also participate in the curriculum. Experts from other institutions will offer Special Subjects courses as affiliate faculty, giving the programme a truly international teaching team. Applications will be accepted from candidates of any nationality. Applicants must have completed at least a B.A. by the time the course commences, and be able to demonstrate reading knowledge of Latin. And it must be underscored that the programme's coursework does presume such reading knowledge. Students currently enrolled in other graduate programmes either at the M.A. or the Ph.D. level may apply, as may post-doctoral scholars. Those currently holding academic or curatorial positions are also eligible. A maximum of 12 places will be available each year, but always with priority being given in the second year of the course cycle to those students who have enrolled for the full curriculum and are pursuing the diploma in Manuscript Studies. Tuition is $2,000 CAD. The Pontifical Institute is, however, able to offer 12 fellowships of up to $6,000 CAD per year, for which all applicants will be automatically considered. Upon acceptance candidates will be asked to submit a budget outlining their anticipated needs. The fellowships are intended to cover the costs of tuition and travel either to Rome or Toronto, as well as providing a modest stipend. Participants are responsible for organizing their own accommodation in Toronto. The University of Toronto's one graduate college, Massey College, also rents a few rooms during the summer. For Massey's Summer Residence Programme see https://www.masseycollege.ca/summer-rentals. Please address all enquiries to Professor Mulchahey.